This Unit 2 Block 1 is 2,315 sq ft. 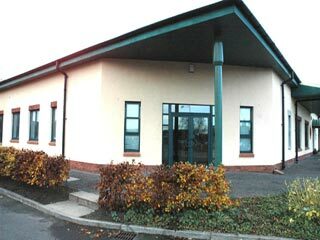 This superb, rarely available corner office accommodation comprises of its own entrance, good-sized open plan reception area with quality laminated flooring, three large offices, 2 small meeting rooms, kitchen and toilet facilities. The office has gas central heating. Telecoms are provided within the property. Good sized windows / glass panelling benefit the unit with excellent natural lighting, giving a bright and airy feel to the property, making a pleasureable working ambience..
Cooperage Way Business Village is a major new development comprising offices and business units in a landscaped setting. Easy access links to Glasgow, Edinburgh and Dundee. The single storey business units are sub-divided into units around 2,000 sq ft, 4,000 sq ft, 6,000 sq ft and 8,000 sq ft and can be configured to suit a customers requirements. 3 phase power and gas central heating. ◾Lease terms are highly flexible and offered on short or long term.